Let's start with the basics, I guess! Amigurumi is a Japanese term referring to the art of knitting or crocheting small stuffed animals and anthropomorphic creatures. Little stuffed toys have been made in many countries, other than Japan, but the term has become the most popular way of referring to them. It's also quite common to refer to them as amis, and I probably will on this page a lot, because I'm lazy like that and amigurumi is sometimes just too much to type. According to an M.E. Williams article on diylife.com, "nuigurumi (noo-ee-goo-roo-mee) is a Japanese word that means stuffed doll, but it refers to sewn fabric items. Ami (ah-mee) is from a word that means crocheted or knitted. So, an amigurumi (ah-mee-goo-roo-mee) is a crocheted or knitted stuffed doll." I crochet all of my amigurumi, because I prefer crocheting to knitting. 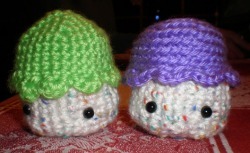 Also, for those already familiar with making amigurumi, you may notice that mine look a bit different from some others. While most people who make amigurumi crochet through both loops, I prefer to only crochet through the back loops. Because of this, mine look sort of "inside out" to some people. They aren't, I just prefer the texture and find it easier to make them that way. You can find amigurumi patterns all over the internet. Some sites offer them for free, just because people don't mind sharing their patterns or because professional websites offer free patterns. You can find free patterns through google, from yarn sites, like LionBrand.com or from crafting forums, such as craftster.org. Other people put a lot of hard work into their amigurumi patterns and, rightfully, charge people for their patterns. You can find lots of patterns through places like Etsy.com or by purchasing amigurumi books from your local book store in the crochet/knitting/needlework sections. I do sell my amigurumi, but mostly only on a commission basis and mostly just for people I know personally. The majority of all I have made, so far, have just been given away as gifts just for friends or for people's birthdays. I don't believe I'm good enough (or fast enough / have enough devoted time) to have a proper store, but if this changes, it will certainly be posted here!